The fact is the idea of facing any bereaved can bring strong men to their knees. Although women are generally more expressive, they also dread the experience. Two common reactions are to avoid the person who is grieving – or feel so uncomfortable that you talk too much to the person, which makes the encounter even more awkward. Why do we react this way? Death is no longer an accepted part of the life cycle, as it was years ago, when life expectancy was much shorter. Death was less mysterious, and it often happened at home. Family members also lived close to each other and (along with neighbors), formed an on-the-spot support system for the bereaved. People felt connected to each other. Today we all want to live forever, and we don't want to be reminded of our own (or our loved ones') mortality. We're also confused about the purpose of expressing sympathy, which makes us feel helpless. We think we have to "fix" the situation and relieve the person's anguish and sorrow, which is, of course, impossible. 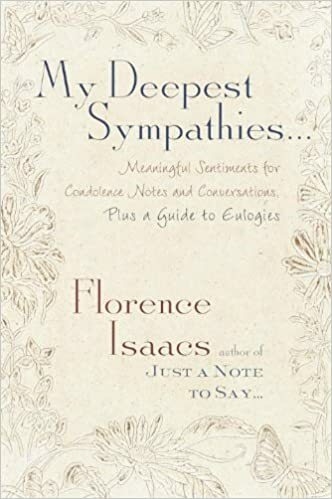 It helps to understand that sympathy is simply an acknowledgement of what has happened. All you have to say is, "I'm so sorry for your loss" or, "I'm sad to hear about your (mother, wife, brother or uncle)." If the death was sudden and/or a tragedy, my response is often, "I don't know what to say to you." That's a powerful statement that sums up the enormity of what has occurred. What happens next? Pause and allow the person to respond. Listening is therapeutic for the bereaved, and can be a great gift. If conversation lags, you might ask, "How are you managing?" And to avoid feeling trapped, arm yourself with an appropriate exit line, such as, "I'm sorry you have to go through this." However, do not ask, "Is there anything I can do?" – which has become an automatic throwaway line – unless you really want to help. It may take some practice to feel less anxious in the face of someone else's grief. But it's empowering, too. Hello Florence..I have the opposite problem...since my husband's death I steer clear of people. I don't want to talk and I know how uncomfortable it does make people feel when they ask how I am doing. Somethimes, if it is a couple, it seems like they have survivors guilt. They are still together while I am not. After 43 years of being together I really don't feel that I fit in so I just avoid places and people. It's surprising how being 2 people together really makes you 1 whole person. My husband is gone 4 years and I miss him so much but I don't talk about it anymore. I have just resigned myself to the way I am and the way life will be for me until we are the completed one person again.